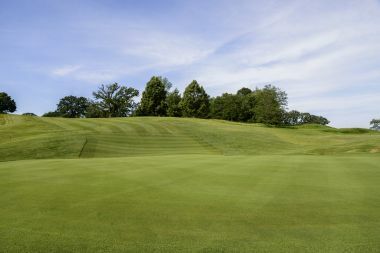 Wirth Golf Club is one of the oldest public courses in the state. The front nine is beautifully set around Bassett Creek with a few man-made lagoons to heighten the challenge. 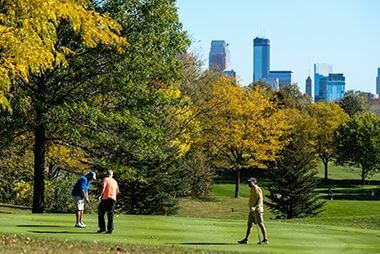 It also offers several scenic views of the Minneapolis downtown skyline. The back nine offers completely different challenges with its rolling hills and mature trees and is a good test of one’s golfing skills. The clubhouse is modeled after a Swiss Chalet and is rather unique in itself. The lower level serves as the clubhouse while the upper level is reserved for rentals such as wedding receptions and various other parties of 100 people or less. 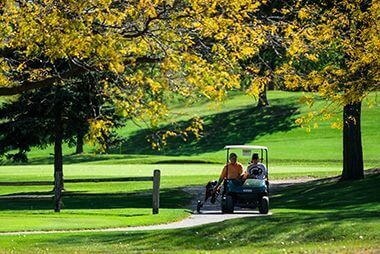 Wirth Golf Course offers a nine-hole Par 3 course also set among the mature trees and rolling hills of the Theodore Wirth Park area. The Par 3 course is located just down the road at 1325 Wirth Parkway. Theodore Wirth – Goodbye to the Temporary Greens. Tournament Fee: $35 per player, payable to Wirth Golf Association. Includes lunch and a ticket for prize drawing. Prizes: Award Ceremony to follow Event Luncheon after play. Are not available to play on Sunday July 15? Stop by to see photo displays of the new improvements, historical timeline, refreshments, and experience the new Olivia’s Café. The Fireplace Room in the Wirth Chalet has a rustic feel with vaulted ceilings and a large wood-burning fireplace. For available dates, rental rates and more information email our Event Consultant or call at 612-230-6427. 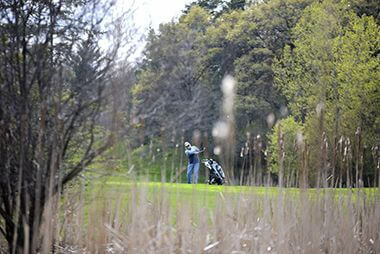 Theodore Wirth Golf Club spent the past few years redeveloping its historical grounds. 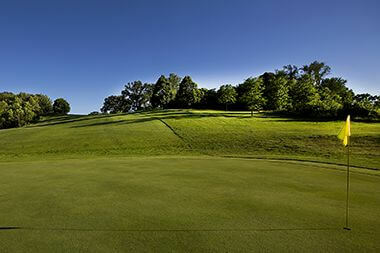 The original nine-hole course opened in 1916 as Glenwood Golf Course and was later expanded to 18 holes in 1919. 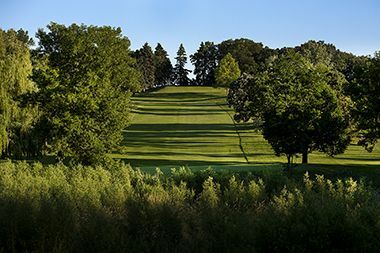 The concept of the renovations of the course currently known as Theodore Wirth Golf Club named in 1938 after the former Minneapolis Parks Superintendent who served almost 30 years came from the vision of building a new Adventure complex to expand winter sledding, cross country skiing and adventure based leisure experiences. 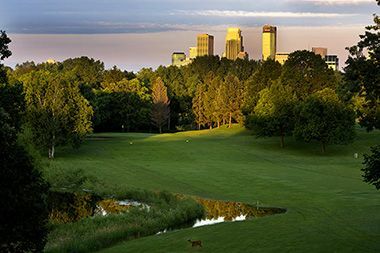 In 2011 Minneapolis Park Board explored the options of reducing the impact which winter activities were having on turf quality and the playability on the golf course. In 2014 the Loppet Foundation begin its journey to expand winter activities that could attract high scale events to our community. Beginning in 2017 Minneapolis Parks and Recreation Board and the Loppet Foundation collaborated to jointly fund the project in Theodore Wirth Park to re generate the quality of leisure experiences to our visitors. Our 18 hole course will have a new playing experience throughout the back 9 hill sides and the classic skyline front has remain the same. If your game does not align with an 18 hole golf experience, you are still in luck. Join us at our Par 3 golf course adjacent to the new Trailhead facility for golf or disc golf play experiences which have also had some redevelopment enhancements. The Trailhead Facility will house a training space, rental shop, Bike maintenance station, and relaxing parkside seating. 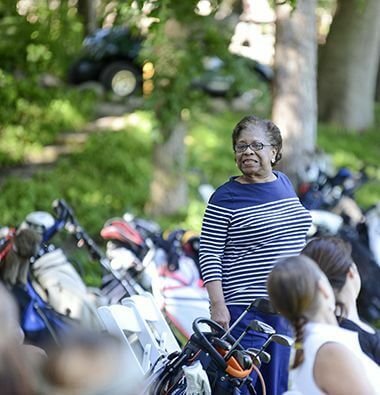 New this year at Theodore Wirth is Instructional Golf Classes for adults and kids. If you have not had the opportunity to learn how to play, this is the season to get out and become Golf Ready! Theodore Wirth Park will become the new “Eat Street” of the North complete with Olivia’s Organic Café specializing in Gluten Free Meal Options and other Boutique dining experiences out of the Chalet Clubhouse, the Trailhead will house Cajun Twist featuring southern comfort food. We hope to see you in the park enjoying all the new amenities the park has a little something fun for everyone. 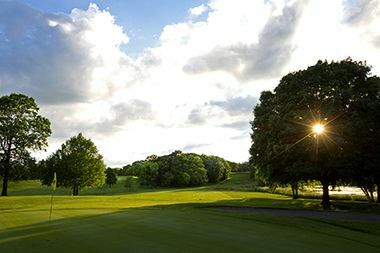 Theodore Wirth Golf Club will host its Grand Re-Opening Celebration on Sunday July 15th with a Tournament play experience. We hope to see you “swinging” by soon, it will be “Wirth” your time. A golf course at Glenwood was finally constructed in 1916, nine years after it had first been suggested in a park board report. The first course was only nine holes and featured clay tees and sand greens. 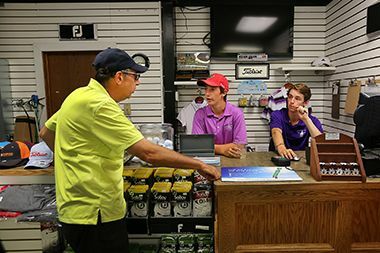 An instructor was hired for the first summer and the popularity of the course exceeded expectations. Although Wirth recommended a charge of 25 cents to play the course, the board voted to make play free that year. 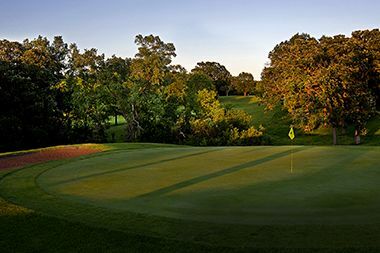 More than 12,000 rounds were played the first season and an estimated 1,000 more rounds were played during an unseasonably warm November after the course had officially closed for the year. 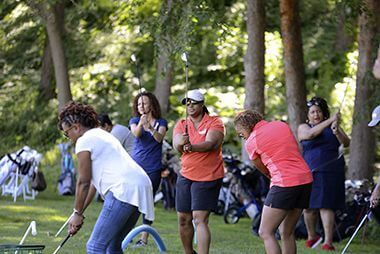 The course was created in what must still be record time: the park board approved creating the course at the end of April—Wirth estimated it could be done for $500—and it was opened for play in June. By that time the Glenwood-Camden Parkway had been completed north to Lowry Avenue. The next season more than 50,000 rounds of golf were played on the course, prompting Wirth to call for a second golf course. Two years later, in 1919, the Glenwood course was extended to 18 holes and a second course of only six holes was opened at Columbia Park That year Wirth also proposed for the first time that the golf course needed a suitable club house instead of the two temporary shelters that had been constructed. 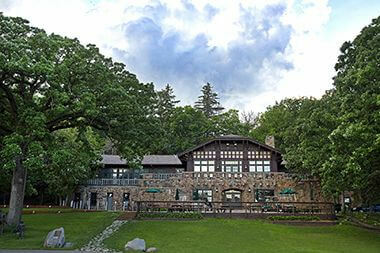 The club house was built three years later in two stages, a second story was added in 1923. Wirth, who was a native of Switzerland, recommended the Swiss Chalet architecture for the club house. Ever the gardener, and a man who was meticulous about the appearance of the parks, Wirth persuaded the board in 1923 to ban the use of spiked shoes on the golf courses. It is not known when that decision was reversed. Wirth wrote in the 1924 annual report that hundreds of golfers had been turned away from the Glenwood course and the expanded Columbia course. The inability of the two courses to accommodate all the golfers who wanted to play led that year to contracts to acquire Armour (Gross) Golf Course and Meadowbrook Golf Course. 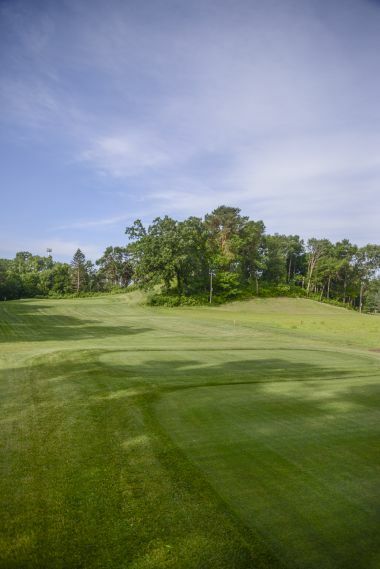 With the increased demand for golf and the higher standards set by the two new courses, Wirth suggested in 1925 that the greens at Glenwood be upgraded from sand to grass and that an irrigation system be installed on the fairways. The price tag of $25,000 he attached to those proposals must have been too much for the park board, however, because the greens weren’t converted to grass until 1935. By that time, during the Great Depression, the use of the golf courses had dropped dramatically. 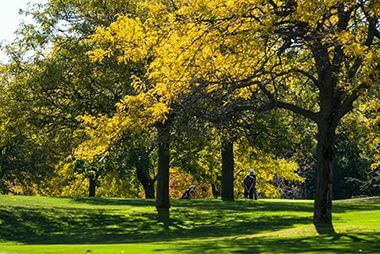 The improvements to the Glenwood course—as almost all park improvement projects in the 1930s—were done as federal work relief projects. Despite hopes that golf course fees would pay not only for the maintenance of the golf course, but other improvements in the park, the Wirth golf course (renamed along with the rest of the park in 1938) operated at a loss through the 1950s. 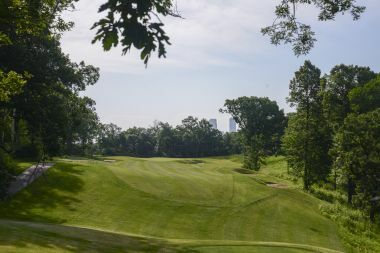 As golf’s popularity picked up again in the early 1960s, the park board added a par three course to WirthPark in 1962 and hired a golf course architect to redesign the back nine of the larger course in 1968. At the same time the Columbia course was lengthened from 4,600 yards to 6,200 yards. The Chalet at Wirth Park was updated extensively in 1998 and in 2004 bronze statues of Theodore Wirth surrounded by playing children were installed between the parkway and the club house. The statues were a gift form the Minneapolis Parks Legacy Society. A disc golf course was added to the Par 3 course in 2011. Theodore Wirth Park will become the new “Eat Street” of the North complete with Olivia’s Organic Café specializing in Gluten Free Meal Options and other Boutique dining experiences out of the Chalet Clubhouse, the Trailhead will house Cajun Twist featuring southern comfort food. We hope to see you in the park enjoying all the new amenities the park has a little something fun for everyone. 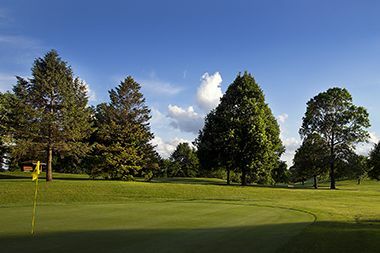 Theodore Wirth Golf Club will host its Grand Re-Opening Celebration on Sunday July 15th with a Tournament play experience. We hope to see you “swinging” by soon, it will be “Wirth” your time.